This lesson will guide you through the process of accessing and using Assessment Reports. Once you clicked on the title of your assessment, you will be taken to the Overview page. This is the list of all Assessment Reports. If you are unsure as to where to start, click on the headings "Where do I start (For....)?" these will display key reports according to your role. 1. Click on the Title of a report to access/use that report. 2. Click on the i icon to see the Report Abstract on a report. This gives a description, purpose and preview of the report. 3. 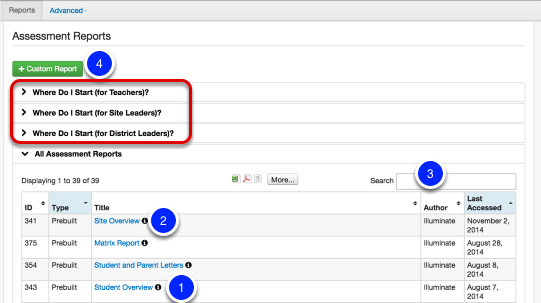 Use the Search menu to quickly find any report by keyword. 4. You can also create a Custom Report using this assessment information by clicking on the Custom Report button. Based on your role, you will be given a variety of filters to use on each report. These will narrow down the students you run this report for by Site, Enrollment/Roster Date, Student Group, Department, Courses, etc. Select your choices. 1. Sites that you have access to will be listed in the Site drop down. Selecting a site will populate the Enrollment/Roster Date drop down with the list of appropriate years and terms you have access to. 2. Departments, Courses, Teachers, Classes and Students are all Optional and simply filter further than just your Site & Year/Term. Each of these fields are filled appropriately based on the site and term selected. 3. Additional filters include things like Programs, Student Groups, etc. These are used for further refining your student selection. 4. Each report has its own unique filters to further narrow down how you would like it to be customized. 5. Click Find Students to run your report. When I select a department, course, etc. will it then limit my results based on my selection below? No. Know what you are looking for and find it in the appropriate field. For example, if you are searching for a list of Mrs. Smith's classes, do not select Mrs. Smith in the teacher field, instead search for Mrs. Smith in the Classes field and all of her classes will appear. Same thing goes for all other fields. Do I have to choose any of these filters to get a list of data or students? No. By default we will attempt to load all of the students you have access to. This means if you are a Principal and have access to all 500 students, we will display all 500 students. Filters will simply limit what students we display. What filters do teachers see on this page? Elementary teachers typically have one class, therefore we only show the student filter. Secondary teachers will typically teach multiple classes and sometimes multiple courses, therefore, they will see the Department, Course, Class and Student filters.